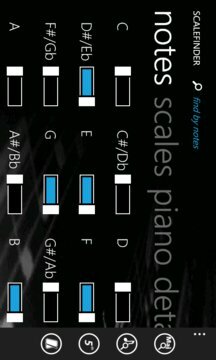 ScaleFinder is a tool that allows you to find scales that match a specified pattern of notes, it can be useful to complete your song or to identify the correct scales to solo. The app also includes two library modes: from scale name and from scale root. 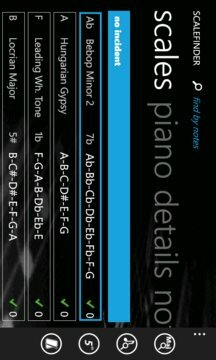 There are currently ***63 scales/modes*** in any tonality! You can set a favorite scale from every available list in the app by holding a tap on a scale row, your favorite scales will be highlighted in yellow in order to regain them easily. Every scale can be played (with real grand piano samples) and displayed on a fingerboard octave. In addition, for every note of the selected scale, a range of corresponding chords can be played and displayed. You also have access to a circle of fifths and to an accurate sound/led metronome that includes tap, beat per measure and subdivision functions. We care about your opinion so don’t hesitate to contact us with any questions, comments or requests.